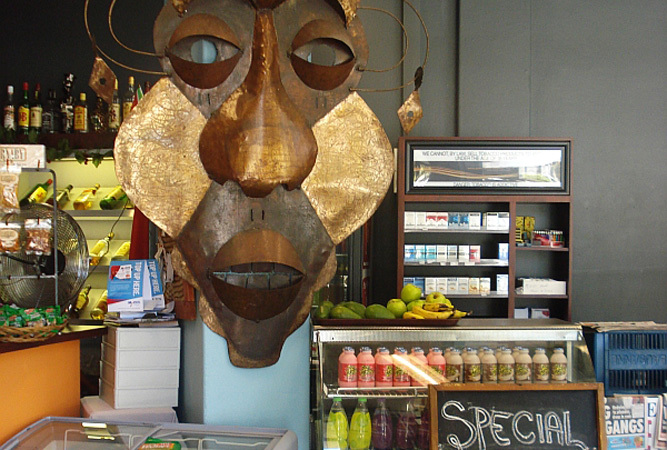 Vista Café needs no introduction to anyone who works around Cape Town’s foreshore. The café is not only inundated with the breakfast, lunch and coffee crowd but it has also been around for thirty or so years – not necessarily in the same building or under the same name, but run by the Da Souza family since time immemorial. I rush in here one morning, my car standing illegally idling outside gasping for a chicken pie (not the car, me). I don’t usually gasp for chicken pies, it isn’t my style at all. Neither is it the type of food I eat. Anyone who knows me would do a convincing jaw-drop-and-stagger if they even heard that I wasn’t ordering broccoli florets on a bed of brown rice topped with gently dry roasted pumpkin seeds. But that’s what having children does to you. In this case it’s only one child. But I’ve found myself accommodating food in to his diet that I considered vaguely Martian before I had him. Worse still, I do this with absolute clarity and little remorse. I will probably spend the latter years of my life in continuous therapy to recover. Behind the counter inside Vista, Carol takes one look at me, takes up my chant for chicken pie and has one in the warmer before you can blink. She’s chatty, fun and charming. She’s everyone’s aunty yet on the ball and quick off the mark. She has a pie in my hands within minutes. My son is a very happy bunny. I’m spared, for the moment. The guy at CMH car dealership where I’m buying a second-hand (new) car just up the road has recommended Vista. He can’t remember the name just the directions, but then neither can I the minute I drive away. What I do remember is that the pie went down a treat, stress was alleviated from an already overwrought mother, and Carol. And so a week later we return (it takes a while to buy a car). This time for a meal. It’s not quite lunch time but already several tables are taken. People are drinking coffee and chatting about work situations. There are no children apart from mine, but he’s already glued to the television screen on one wall (I’ll now have to be in therapy forever). The menu is nothing to write home about. The food is homely but conventional – lots of breakfasts, burgers, omelettes, salads and wrapps and their famous home baked goods that include pies, croissants, muffins and a cheese Copenhagen. But it is all delicious, and unpretentious. My son has another pie, this time smothered in gravy to which he takes an instant dislike, but motors his way through the chips. 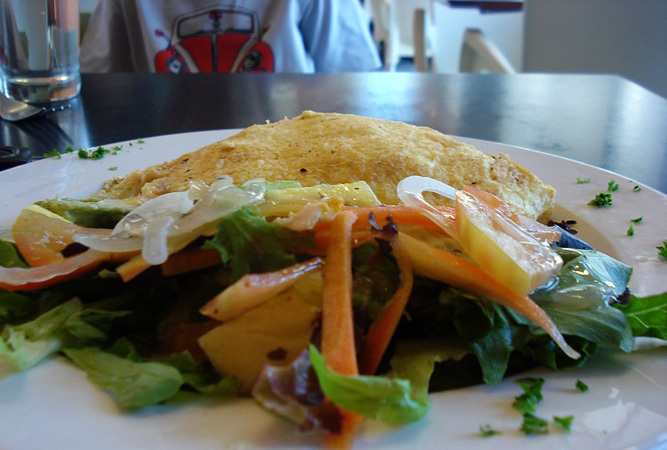 I try the smoked chicken mayo and avocado omelette, which comes with toast and salad, and momentarily give up trying to change the way my son eats. Carol remembers me, though goodness knows how when she must deal with so many customers a day. When she tells me that she’s worked here for 24 years I understand how she manages to feel like the anchor of the place, particularly as most of the customers are regulars. The place hums constantly. 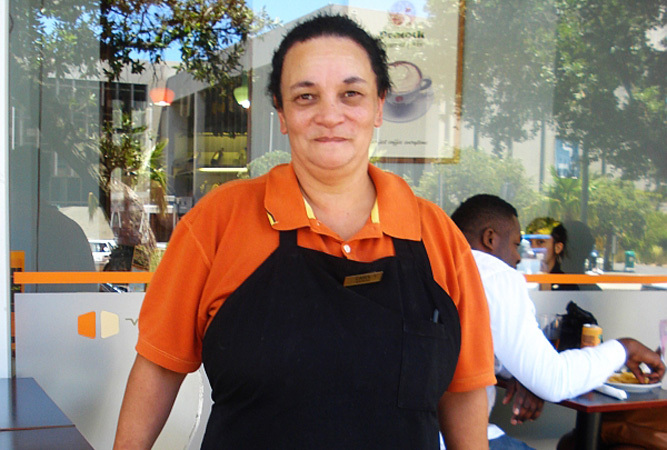 Most people know Carol by name; people shout greetings as they come and go. For a minute it’s as if I’m in a New York diner. 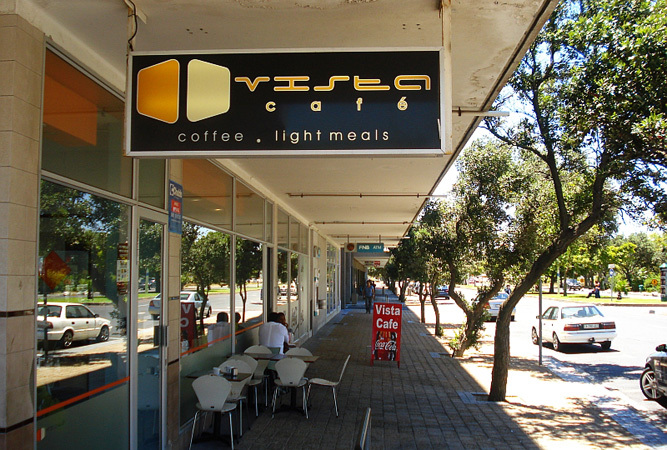 You can find Vista Café at 44 Hertzog Boulevard, the Foreshore in Cape Town.